I've been a fan of Rob Balder's Erfworld since it launched. 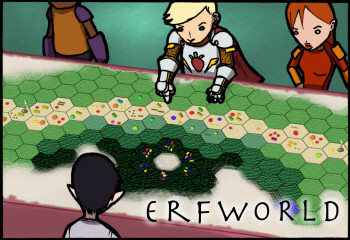 If you like comics, and have not encountered Erfworld, you should click over there and start at the beginning, but you'll have to make a Will roll at a large penalty to avoid the compulsion to just keep reading until you're up to date. I don't want to spoil, so I'll just say that it involves a world with very gamelike physics and a cast of characters that invites comparison to Game of Thrones (equally scary politics in a gamelike frame, equally complex plot, higher body count, less on-screen nookie, and much more frequent updates). Plus a great deal of wordplay. Rob has a Kickstarter going (almost over, so if you like Erfworld, do not hang back and think about it . . . go support now!) It's already reached its goal plus some stretches, so the comic will continue through another book, and the hardcover release of that book will be very nice indeed. I read this strip regularly, and sometimes lurk on the forums and enjoy the fan speculations about what happens next. Erfworld has entertained me for years, and I want that to continue. So . . . I supported at the top level, which incidentally means that at some point there will be a multi-page story built around a character not entirely unlike me. This is part of the continuing effort to plow some Munchkin money back into geekdom, and Rob Balder has responded by suggesting that one of the Erfworld artists can do something original for an Erfworld-referencing Munchkin card. Awesomeness begets awesomeness begets awesomeness! So that's what I did today to justify my existence. To repeat the plug: Read the strip, if you haven't, and if you like it, go support the Kickstarter.